When Madison took her first tentative steps as a 1-year-old, her parents noticed she seemed to favor her right side and tended to swing her left leg around as she ambled across the floor. It’s not uncommon for children to struggle a bit when they’re first learning to walk, so Madison’s pediatrician suggested they wait to see if she improved. But the problem persisted for months, and she was eventually sent to a specialist. That’s when her parents learned that Madison had cerebral palsy. But Madison’s parents were not going to let this diagnosis define their child. 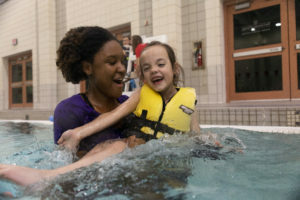 Madison’s teacher suggested that the family contact the University of Georgia’s Pediatric Exercise and Motor Development Clinic, which helps children with disabilities lead a more active life. That’s where Madison met Sydney Hollingsworth, a health and physical education major from Columbus, who developed a personalized plan to help boost Madison’s strength, balance and confidence. 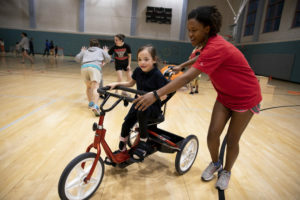 Madison and Sydney met every week at UGA’s Ramsey Student Center, where they would swim, ride bicycles, play hopscotch or floor hockey, all activities designed specifically to address Madison’s unique needs. And Madison’s parents have already noticed big changes. Since she started working with Hollingsworth, Madison has learned to swim, her mobility has improved and she can walk on a balance beam with very little assistance. But perhaps the most noticeable change has been in Madison’s confidence. The clinic, which is part of UGA’s College of Education, has been in operation for more than 40 years, and it was developed by Ernie Bundschuh, professor emeritus of physical education. It is a nine-week program held each fall and spring semester that is open to individuals with disabilities age 2 to 14. 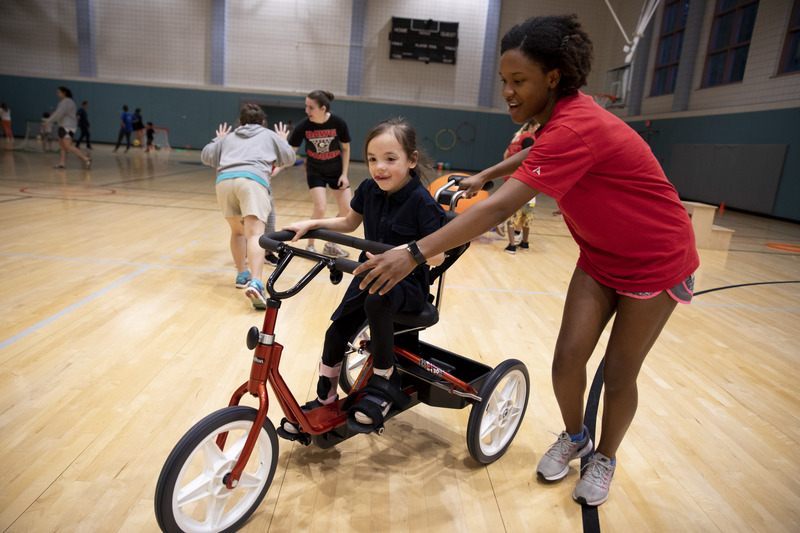 Each child is paired with a UGA student enrolled in an adapted physical education class who develops an exercise program that is supervised by faculty and graduate students. The program is $30 per child, per semester, and enrollment is limited depending on the number of UGA students enrolled in the class.